HDMI specification 1.4a. Maximum resolution is 1920 x 1080 at 60 Hz. It is a great question. Is it possible to connect a touchscreen via HDMI to the EPIC? Is the EPIC HDMI purely for viewing purposes? 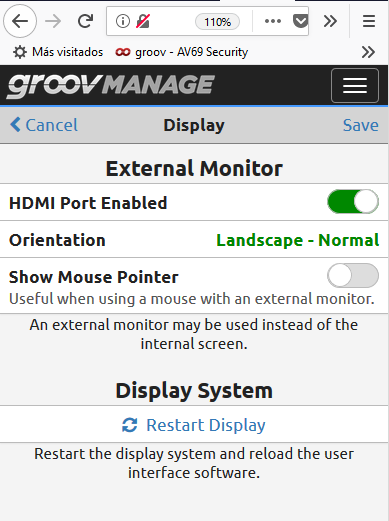 You can indeed directly connect a touchscreen directly to EPIC to run groov View as long as it uses a standard USB mouse emulation to feedback user interaction. Just connect this cable to one of EPIC’s two in-built USB serial ports. For complex graphics, the initial page build is maybe not as fast as if you would offload this task to an independent device with its own processor and web browser, but user interaction and data update is just fine. We have found that not all screens automatically adjust to the maximum resolution offered by EPIC, but in general, the concept works just fine. You can set the external view mode to be portrait or landscape in groov manage. EPIC is the first PAC in the world to have a direct HDMI output. But before anyone starts bitching, it does not have a dual video output, So if you plug in something to the external HDMI, the integrated touchscreen is automatically disabled. On a slightly related subject, however, different networked browser devices will allow different groov pages to be displayed at the same time, so you could technically build an EPIC video wall.